Adaptable to any nursing framework, this classic resource provides clear, comprehensive coverage of every aspect of critical care nursing practice. It’s organized in nine units around alterations in body systems, with a focus on evidence-based practice, collaborative management, and patient safety. The depth and scope of this textbook make it a long-lasting value that you will rely on throughout nursing school and well into clinical practice. Evidence-Based Practice: Collaborative and Evidence-Based Practice: Nursing boxes offer the latest evidence-based management guidelines for both collaborative and nursing care and highlight the importance of basing practice on strong evidence. Collaborative Management boxes examine the interdependence of nursing and medical practice and demonstrate the importance of teamwork in the management of critical care patients. Pharmacologic Management tables in each therapeutic management chapter provide a quick summary of drug names, recommended dosages, drug actions, and special considerations for the drugs most often used in critical care. 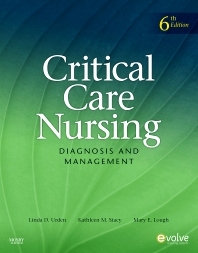 Nursing Diagnoses boxes in every disorders chapter list common diagnoses in priority order for each body system, encouraging critical thinking and effective decision-making. Patient Safety Alerts highlight potential safety issues related to chapter content as identified by the Joint Commission. UNIQUE! Data Collection boxes in assessment chapters outline all the information required for a complete patient assessment. Patient Education boxes offer quick access to the concepts that must be taught to the patient and the family before discharge from the ICU. Nursing Interventions Classification (NIC) boxes list the important nursing actions for a variety of nursing interventions that are part of the therapeutic management of a critically ill patient. Genetics in Critical Care NEW!